The world's largest cruise ship has arrived. Royal Caribbean International says its Harmony of the Seas is so humongous that it should be called a city. The cruise ship, which sets sail from Barcelona, Spain, on June 7, is longer than the Eiffel Tower is tall and wider than any other ship in its class. It features the "tallest slide at sea," according to Royal Caribbean, plunging thrill seekers 100 feet. More than 20 other water attractions, including swimming pools, whirlpools and a water park, share over 2,100 tons of water. 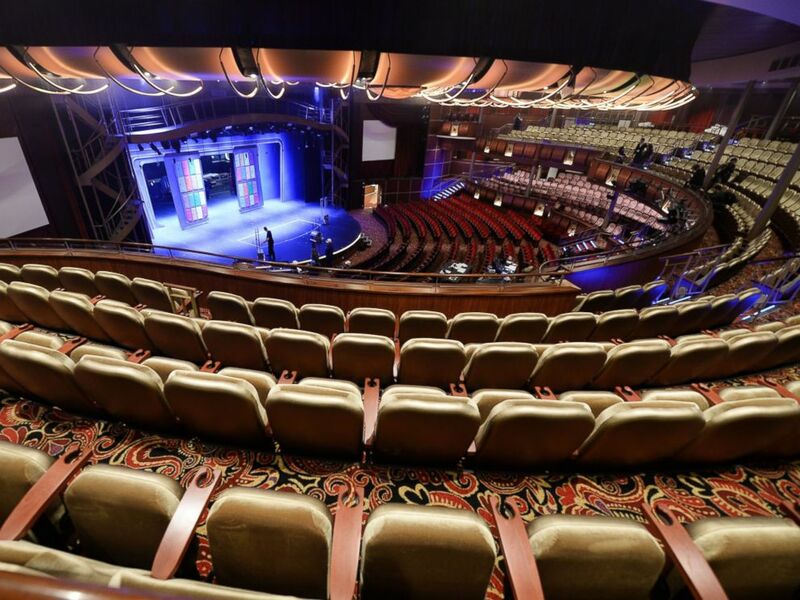 A picture taken on May 12, 2016 at the STX shipyard of Saint-Nazaire, western France shows the auditorium inside the Harmony of the Seas cruise ship during the delivery ceremony of the boat. The sea giant also boasts its own Central Park, with more than 10,500 living plants, some rising over 20 feet. Crew members of the Harmony of the Seas cruise ship are pictured at the STX shipyard of Saint-Nazaire, western France on May 12, 2016 as they attend the delivery ceremony of the boat. More than 2,700 staterooms are sprawled over 16 stories for occupancy by more than 5,400 guests. Add 2,100 staffers, and the citylike ship still hasn't reached its maximum occupant capacity. 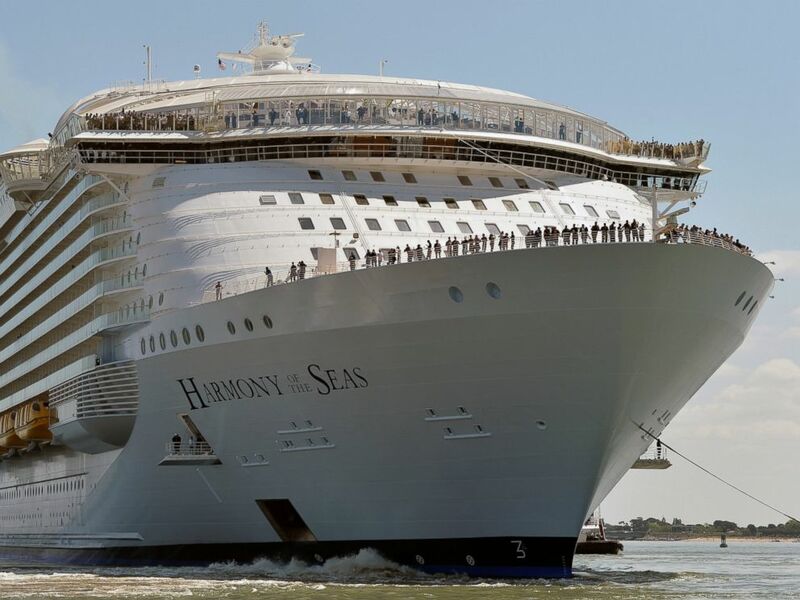 Harmony of the Seas tips the scale at 227,000 tons. The price tag to put this megaship together? More than $1 billion over the course of three years. 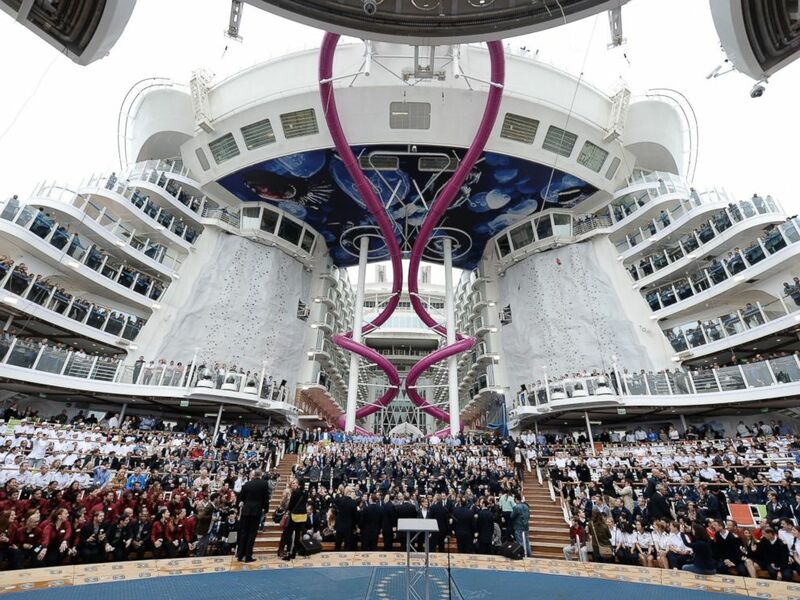 Harmony of the Seas will outdo its two closest competitors, Oasis of the Seas and Allure of the Seas, by more than 1,700 tons and nearly 100 passengers. The cruise ship is expected to arrive at its Fort Lauderdale, Florida, port in November. A photo taken on May 15, 2016 shows the Harmony of the Seas cruise ship as it sails from the STX Saint-Nazaire shipyard, western France, out to sea.